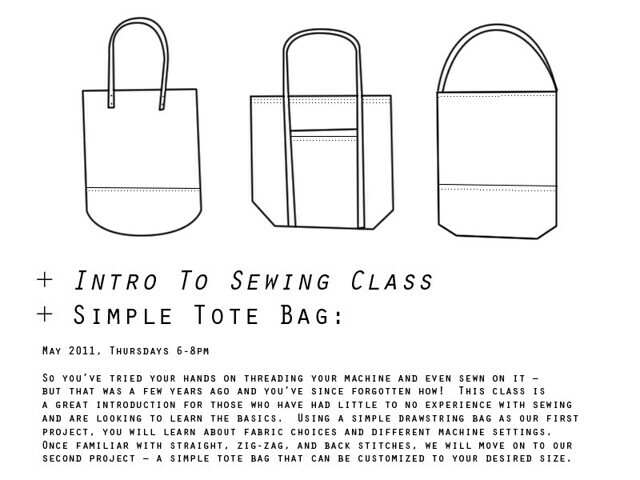 intro to sewing : tote bag class! Hey guess what? I'm teaching a sewing class in May! It will run four consecutive Thursday evenings from 6-8pm. This will be a beginning sewing class where we complete two different projects. The first is a simple drawstring bag (to familiarize yourself with the machine and stitching) and the second project is a simple tote bag made to your size specifications. We will mainly be using quilting cottons and light weight upholstery fabrics, and will sew on commercial home machines. I wish we could use leather but I think the machines wouldn't be able to handle it - though if you want to rivet leather handles on to a bag we could probably do that! I'm always up for anything! I'm really excited about teaching and can't wait. The class will be held at the new knitting and sewing store JP Knit and Stitch here in the Jamaica Plain neighborhood of Boston. For more information about timing, class description, location, etc., please email me at julia[at]renneshandmade.com. You can also check out their website here, though I don't think their entire class schedule is online yet.